A subset of nuclear replicating viruses assemble their capsid into the nucleus. This implies that all capsid component are targeted to the nucleus through nuclear localization signals (NLS) containing proteins. 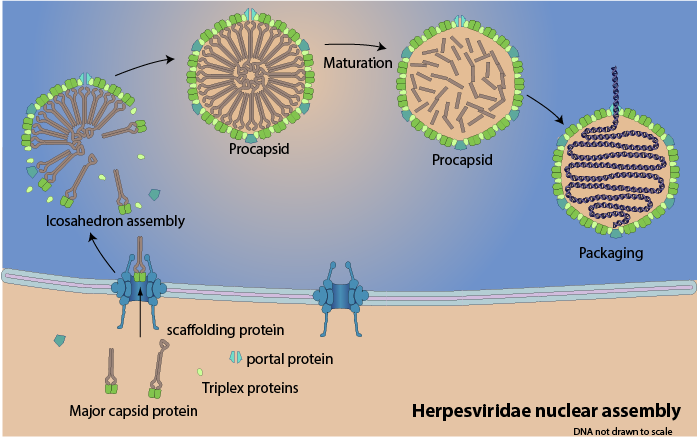 The assembly of large icosahedral empty capsids for Herpesviridae and Adenoviridae relies on non-structural proteins that acts as chaperones for assembly. These proteins are called scaffolding proteins. Cell defense: In mammals the antiviral PML bodies are able to trap and inactivate viral capsids in the nucleus, this process is counteracted by PML disruption viral proteins.